The moment someone says Athirappilly (also Athirapally), we get a vision of actress Aishwarya Rai dancing for the song 'Barso re'! This song flashes first although Athirappilly has been shot in several South Indian as well as Bollywood movies. This waterfalls is a favourite destination for many and it continues to attract many tourists year-round. What makes it such a famous place? How did the popularity of this place increase over time? Here are some amazing things to know about Athirappilly Falls that answers all these questions and much more! Athirappilly is not only located in Chalakudy Taluk of Thrissur but is also formed by the Chalakudy River. It actually originates in Anamalai ranges but forms a big river by joining to other streams. The beautiful Chalakudy River plunges here as Athirappilly Falls. Athirappilly Falls is known for its picturesque vistas; its formation resembles the popular Naigara Falls in the USA. So, Athirappilly Waterfalls is fondly called as "The Naigara of India". It is also the largest waterfalls in Kerala. The dense vegetation of Vazhachal forest division is located around Athirappilly Falls. It is said that it is one of the best bio-diversity hotspots in Kerala. Interestingly, Athirappilly - Vazhachal region is a home to four kinds of Great Indian Hornbill. The lush vegetation supports rich wildlife and avifauna. The forest reserve is also a habitat of elephants, bisons, tigers, leopards and many other animals. Hence, the region of Athirappilly is one of the best wildlife destinations in Kerala. The Chalakudi river branches out a bit to form the nearby Vazhachal Waterfalls. It is one of the untouched destinations located at the tip of Sholyar ranges. Vazhachal Falls is locally known as Charpa Falls and is one of the must-visit offbeat places near Athirappilly Falls. The protected lush green regions around Athirappilly is famous for jungle safaris. The diverse species of birds and animals along with the tourist places like Vazhachal Falls, Thumboormuzhy Dam and Athirappilly Falls make it a best eco-tourism spot. 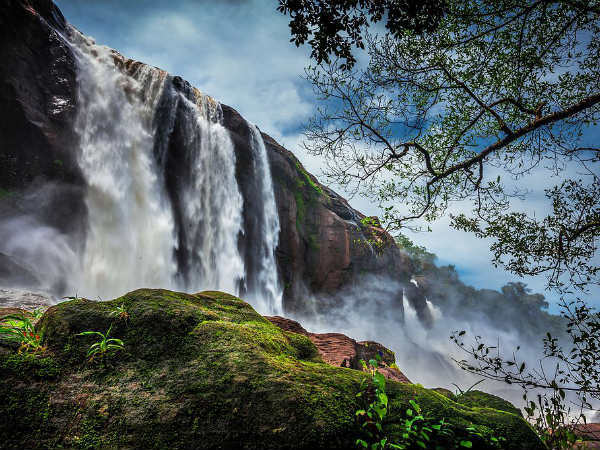 One of the reasons behind the popularity of Athirappilly Falls are the movies that were shot here. Athirappilly Falls is one of the top film shooting locations in India. There is a big list of hit movies which brought fame to this beautiful place. Bollywood films like Guru, Dil Se, Khushi, Yaariyan and South India films like Punnagai Mannan, Paiyaa, Happy, etc. have shot some songs and scenes at Athirappilly. The gushing waters of Athirappilly Waterfalls can be used for producing electricity. A Hydro Electric Power Project was proposed to build at Athirappilly. However, it was opposed by several wildlife conservationists and naturalists. Since, the region is a biodiversity hotspot, a hydro-electric project would destroy it. In fact, it is still an ongoing controversy and no decisions have been made to continue the project or not. Athirappilly Falls is surely one of the most-scenic destinations in Kerala. A visit to this popular waterfalls will satiate the nature lover in you!